A few days after starting an experiment you should begin to see statistics appear on your Experiments page. The prismic.io data-visualisation and metrics make it easy to see how each variation is performing compared to the others. 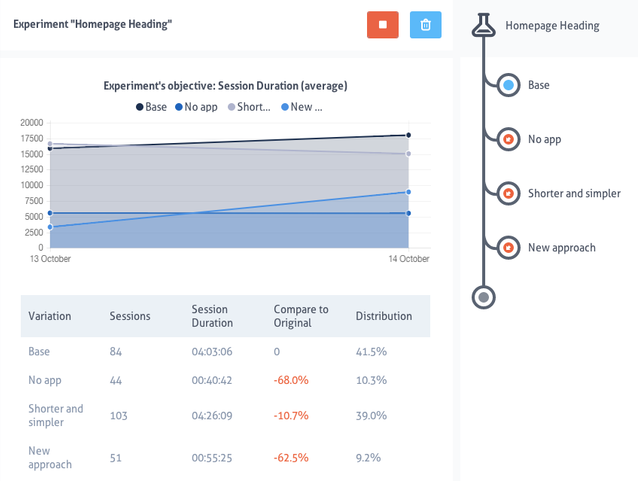 Once you are satisfied with the results, you can end the experiment and select which variation you would like to publish live. Select the winning variation from the panel on the right. Then click on the "Publish as winning variation" button at the top. This will end your experiment and you will see that the winning variation is published live. You will now be able to start a new experiment. If you wish to end an experiment without publishing a variation, simply click on the "Stop experiment" button at the top of the Experiments page. This will end the experiment and delete any document versions added to an experiment variation. You will then be able to start a new experiment to continue improving your site!